Hello, neighbor. As you listen to this radio program week out and week in, do you find yourself at times questioning the validity of certain musical selections? Do you grow weary of hearing permutations of what sounds like the same already superfluous composition played over and over again? Do you sit patiently by while tunes better suited to accompanying the local forecast on The Weather Channel fritter away precious air time, time that, were you given the opportunity to change program content, would mirror your own superior personal taste? Do you hate the sound of balloons? Can you see yourself interviewing real tunesmiths instead of the ficticious songmeisters dreamed up by K&D's Research Division? If the answer to any of these questions is yes, then you're ready for Kalvos & Damian's Bulimarexia School of Radio Listening. 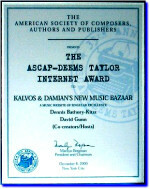 The K&D BSofRL is a fully accredited institution of musical learning headquartered on the internet. The Bulimarexia School models its teaching philosophy on the positive traits of bulimia and anorexia, two eating disorders popular with the avant-garde gastronomic crowd. Say you're in the car driving home from work with the radio tuned to your favorite NPR chat show, present station excluded. A news bulletin reports a massive traffic jam in front of you and recommends an alternate route. But it's too late -- you just missed the exit. What do you do? "Theories of Binge Listening," an entry level course, explains your options, plus explores numerous pro-active case studies. Or if you haven't been able to tune in a spunky morning radio personality for years because of an aversion to her sunny disposition, when deep down you know she's a mean-spirited old hag who sold her first born into slavery to pay for a white wine addiction, you'll better be able to cope with the Bulimarexia School's "Purging the Airwaves," a popular advanced course. Not beholden to any strict moral code that a land grant university or private school might feel obligated to uphold, the K&DBSofRL is free to offer unusual and sometimes untested but innovative solutions to deal with problem students. Electronic beta wave therapy, random memory swappage, systemic inner ear aggravation, and John Tesh Algonquin Hole transformation are but a few of the disciplines offered at the Bulimarexia School -- and all for less money than you'd spend digitizing your LP record collection. For more information, visit the BS of RL at its virtual showroom at the Kalvos & Damian page on the maltedmedia website. A counterpart to Kalvos & Damian's Bulimarexia School of Radio Listening is the Bulimarexia School of Composition. This grade-free collegiate enterprise advocates periods of binge writing -- including excessive copying out of parts, often in triplicate -- followed by extended episodes of self-induced nonexpressionism and refusal to hum, all in a pleasingly antisocial environment. In only four months, the BSC has been home to numerous composers, who have naturally requested anonymity, going through disquieting periods of self-doubt, writer's block, hackneyed jingle production, and worse. And many graduates have sung the school's praises, often in song form that has gone on to win prestigious recording industry awards. For a free prospectus and hearing loss waiver, just send $2.00 to Kalvos & amp; Damian's Bulimarexia Schools, attention Department de la Flambeau, in care of this station. And while the previous announcement in no way reflects the views of this station, its sponsors or assigns, it does serve as a timely introduction to the 172nd episode of Kalvos & Damian's New Music Bazaar, not to mention its chief vocal constable, himself a graduate of the K&DBSofRL, Kalvos.